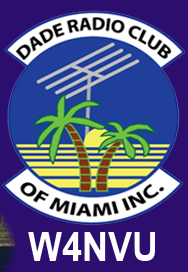 Preamble: Admin Net – W4NVU – Dade Radio Club of Miami Inc.
Hello all stations, hello all stations, hello all stations this is _____________ (Call sign) opening the Main Portion of the Miami-Dade Emergency Net for Wednesday _________________(Date). The purpose of this net is to determine which stations will be available in the event of an emergency and, to train stations in proper net procedures. This net is affiliated with the RACES program and club membership is not required to participate in these nets. the nature of the traffic when net control acknowledges. This concludes the roll call of the Miami-Dade County Zone nets. Are there any stations who have not checked into any zone nets? All stations stand by for the information stations. This concludes the Miami-Dade Emergency Net for _____(Day/Date)______________ . Our appreciation goes to the group in charge of this repeater and, we will now be returned to normal use. This is ____________ (call sign) clear.